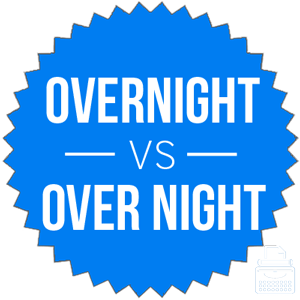 Home » Overnight or Over Night – What’s the Difference? Depending on where you live in the world, a thunderstorm that happens while you are sleeping can turn a hot, dusty week into a dewy morning paradise that smells like fresh, wet earth. Such thunderstorms could be said to happen overnight. People can also change their minds overnight, and something that lasts all through the night into the next day is also an overnight affair. Are there ever any situations where you should separate this compound word into its individual constituents? Continue reading to find out. What is Difference Between Overnight and Over Night? In this article, I will compare over night vs. overnight. I will use each of variation in at least one example sentence, so you can see it in context. Plus, I will show you a helpful memory tool that will make choosing over night or overnight much easier. What does overnight mean? Overnight can be many parts of speech, including an adjective, an adverb, or a verb. The overnight thunder showers left puddles on the sidewalks, but the sun is already shining this morning. The pitcher’s overnight transition from mediocrity to stardom was too good to last. As an adverb, overnight means much the same thing, but it describes a verb instead of a noun. Wendy’s change from gawky middle schooler to teenage prom queen seemed to happen overnight. The electorate changed their minds overnight, and the heavy favorite lost in a stunning upset. It really only has two main meanings as a verb: sometimes, it means to ship something fast enough that it arrives the next day, and other times it means to sleep somewhere. A parts supplier might overnight a crucial part to a client so that it arrives as soon as possible. Backpackers might also overnight in a campground on their way to a more remote location. I’m sorry I forgot to ship your package; I will overnight it to you so that it still gets there by the delivery date. We will overnight in the River Falls State Natural Area before continuing on our way to Lost Lake. Over night is never a substitute for overnight. It is occasionally used, though, to demonstrate a preference for night over something else, like day. Someone might say “I prefer day over night,” for instance. Of course, in this example, over and night just happen to be next to each other. They don’t relate in anyway to overnight. Now, let’s go over a trick to remember overnight vs. over night. Overnight and overboard should both be spelled as a single word. So you never have to worry about going overboard with overnight—there is exactly one situation where over night is correct, and everywhere else, overnight is the better choice. So go overboard! Is it overnight or over night? Overnight can be an adjective or an adverb. Either way, it refers to something that happens in the span of time between one day and the next day. You should not use over night. Unless you are telling someone how much you like night, use overnight. 1 What is Difference Between Overnight and Over Night?